Nothing beats a good old-fashioned comic book crossover, whether it’s because a villain has appeared who is too tough for one hero to defeat, something has put the normal hero out of commission, or simply because a book’s sales are tanking and the publisher needs a flashy gimmick to trick people into buying it. The CW’s superhero shows figured out the power of a crossover a long time ago, with The Flash’s Barry Allen popping up on Arrow before his own show had premiered. 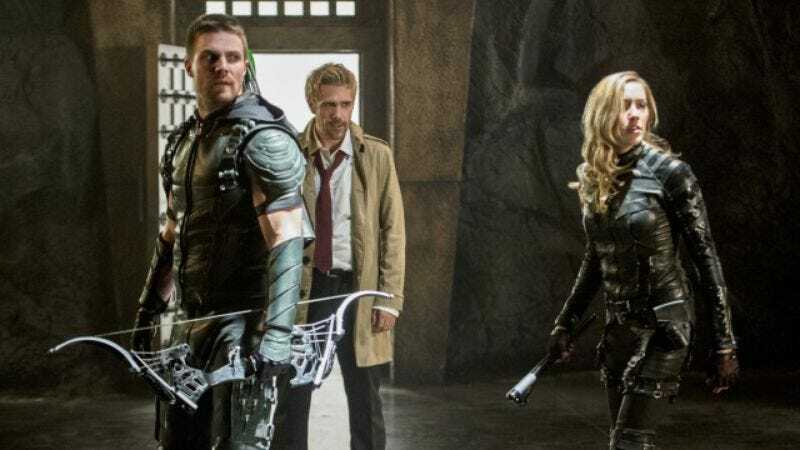 Now, a Flash/Arrow crossover has become an annual event on the network, and the idea is so well-received/good for ratings that the crossover is getting its own spinoff with Legends Of Tomorrow—not to mention the fact that the star of NBC’s short-lived Constantine adaptation even showed up on Arrow earlier this season, giving us a rare cross-network crossover. According to a big rumor, though, DC’s various superhero shows might soon be getting even friendlier. This comes from Bleeding Cool and is in no way an official announcement of any sort, but supposedly The CW is in talks with CBS about a crossover between The Flash and Supergirl, and the latter’s continued existence might even depend on this crossover happening. This would require some narrative hoops, because Supergirl takes place in a universe where Superman is a well-known hero and The Flash absolutely does not, but that show has recently introduced the idea of alternate realities that can be accessed with relative ease, so it’s not too far-fetched. Still, it’s just a rumor for now, so there’s a very good chance it’ll never happen anyway. Speaking of things that are just rumors and may never happen anyway, Bleeding Cool also says that Matt Ryan’s Constantine—fresh off of his aforementioned Arrow appearance—will join the cast of Legends Of Tomorrow for a still-hypothetical second season. The site is significantly less confident in this story, mostly because Legends is already “incredibly expensive” and might just be replaced with “a totally different show” next year. However, since Legends won’t even air until 2016, any predictions about what might happen to it in the future do seem a bit premature. Not too premature for us to talk about how weird it would be to see Ryan’s Constantine interacting with a goofball like Brandon Routh’s Ray Palmer, but premature nonetheless.